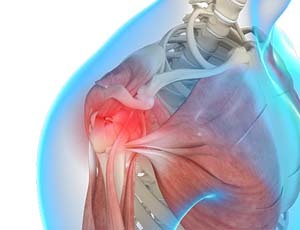 The shoulder joint is a ball and socket joint. A ‘ball’ at the top of the upper arm bone (the humerus) fits neatly into a ‘socket’, called the glenoid, which is part of the shoulder blade (scapula). The labrum is a ring of fibrous cartilage surrounding the glenoid for stabilization of the shoulder joint. The biceps tendon attaches inside the shoulder joint at the superior labrum of the shoulder joint. The biceps tendon is a long cord-like structure which attaches the biceps muscle to the shoulder and helps to stabilize the joint. Shoulder joint is the most flexible joint of the body. It allows different motions of the hands making it possible for us to do a vast array of different activities. However, its flexibility makes it more prone to injuries. A fracture is a break in the bone that commonly occurs as a result of injury, such as a fall or a direct blow to the shoulder. The type of shoulder fracture depends of the age of the patients. Clavicle fractures are more common in children. A fracture of the upper part of the arm (proximal humerus) is more common in elderly individuals and its frequency increases with age. A clavicle fracture, also called broken collarbone is a common fracture that happens to people of all ages. The collarbone, also called the clavicle, is the bone that connects your sternum or breastbone to your shoulder. A broken collarbone normally occurs after a fall onto the shoulder or a motor vehicle accident. The most common sports associated with clavicle fractures include football, hockey, and skiing. To diagnose a broken collarbone, Dr. Patel will take a brief history, about the injury, and perform a physical examination of your shoulder. An X-ray of the clavicle is taken to identify the location of the fracture. Dr. Patel may also recommend a computerized tomography (CT) scan in some cases. Most broken collarbones heal without a surgery. An arm sling may support the arm and hold the bones in their normal position. You may also be given pain medications to relieve the pain. After your pain reduces Dr. Patel may recommend gentle shoulder and elbow exercises to minimize stiffness and weakness in your shoulder. Follow up with Dr. Patel until your fracture heals. Surgery may be required in case of displaced fractures. Surgery is performed to re-align the fractured ends and stabilize them during healing. Surgery often involves use of plates and screws to maintain proper position of the bone during healing. Humerus is the upper arm bone and it forms two joints —shoulder joint and elbow joint. The proximal humerus refers to the upper end of the arm bone, which forms shoulder joint. Fractures of proximal humerus are common in elderly individuals, suffering from osteoporosis. Fractures may be caused by traumatic injuries such as a fall on outstretched hand, from greater heights or motor vehicle accidents. In younger individuals, a severe trauma can cause these fractures. Greater tuberosity fractures: Greater tuberosity is the insertion site for attachment of rotator cuff tendons. Greater tuberosity fractures are less common and are seen in cases of shoulder dislocations and in those with osteoporosis. Lesser tuberosity fractures: These fractures often caused by posterior shoulder dislocations or traumatic muscle contractions by electrical shock or convulsions. If left untreated, these fractures cause subscapularis muscle (stabilizer and mobilizer muscle) deficiency and requires a major muscle transfer procedure. Surgical neck fractures: Fractures of the surgical neck are most common in patients with osteoporotic bone. These fractures also damage the axillary nerve that carries sensory impulses to the shoulder. Humeral head fractures: Humeral head fractures are very often in elderly individuals and chances are more in those with osteoporotic bone. These fractures occur in younger individuals by significant trauma whereas a mild traumatic injury can cause fracture in elderly individuals with osteoporosis. In addition to above, another type of proximal humerus fractures is two, three, and four-part fractures, a fracture that cause multiple fragmentation of the proximal humerus. Patients with proximal humerus fracture experience pain, swelling, and restricted motion of the shoulder. Most common symptoms of shoulder dislocation are pain and shoulder joint instability. Other symptoms such as swelling, numbness and bruising may occur. At times, it may cause tear in the ligaments or tendons of the shoulder and nerve damage. Dr. Patel will examine your shoulder and may order an X-ray to confirm the diagnosis. The condition is treated by a process called closed reduction which involves placing the ball of the upper arm back into the socket. Following this, the shoulder will be immobilized using a sling for one week. Ice may be applied over the area for 3-4 times a day. Rehabilitation exercises may be started to restore range of motion, once the pain and swelling decrease.